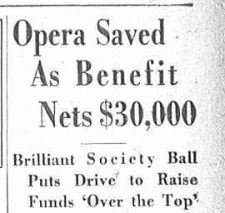 Retiring, later that she wanted at age 48, Lucrezia Bori helped save the Metropolitan Opera. While the Metropolitan continued to sell tickets to performances with no difficulty despite the Great Depression. The contributions of its stockholders fell off dramatically and by the end of 1932 the board of directors found that a great deal of money would be needed if the next season were to be held. Here at the Recorded Sound Archives we are celebrating Women’s History month through music by highlighting the voice of Lucrezia Bori and her accomplishment of saving the Metropolitan Opera.